From serendipitous camping trips to forging international consensus on big-budget observatories, the 2018 Kavli Prize laureate discusses her personal and professional journey into the field of astrochemistry. NOT ALL OF SPACE is such a barren place. Galaxies are chock-full of dusty clouds containing rich stews of molecules, ranging from simple hydrogen gas to complex organic substances critical for life's development. Grasping how all these cosmic ingredients intermix in the forming of stars and planets has been the life's work of Ewine van Dishoeck. A chemist by training, van Dishoeck soon turned her eyes to the cosmos. She pioneered many advances in the emergent field of astrochemistry, harnessing the latest telescopes to reveal and describe the contents of vast star-bearing clouds. In parallel, van Dishoeck pursued laboratory experiments and quantum calculations on terra firma to understand the breakdown of cosmic molecules by starlight, as well as the conditions under which new molecules stack together like Lego bricks. "For her combined contributions to observational, theoretical, and laboratory astrochemistry, elucidating the life cycle of interstellar clouds and the formation of stars and planets," van Dishoeck received the 2018 Kavli Prize in Astrophysics. She is only the second laureate in any field to have been distinguished as a sole recipient of the prize over its history. To learn more about her breakthrough career in astrochemistry and what's next for the field, The Kavli Foundation spoke with van Dishoeck from her office at Leiden Observatory at the University of Leiden in the Netherlands, just prior to her attending a staff barbeque. Van Dishoeck is a Professor of Molecular Astrophysics and the President-Elect of the International Astronomical Union (IAU). The following is an edited transcript of the roundtable discussion. Van Dishoeck has been provided the opportunity to amend or edit her remarks. THE KAVLI FOUNDATION: What does astrochemistry tell us about ourselves and the universe we live in? EWINE VAN DISHOECK: The overall story told by astrochemistry is, what is our origin? Where do we come from, how were we built? How did our planet and Sun form? That ultimately leads us to try to discover the basic building blocks for the Sun, the Earth, and us. It's like Legos—we want to know what pieces were in the Lego building set for our solar system. The most basic building blocks are of course the chemical elements, but how these elements combine to create bigger building blocks—molecules—in space is crucial for understanding how everything else came to be. TKF: You and other researchers have now identified more than 200 of these molecular building blocks in space. How has the field evolved over the course of your career? EVD: In the 1970s, we started finding that very unusual molecules, such as ions and radicals, are relatively abundant in space. These molecules are missing or have unpaired electrons. On Earth, they don’t persist for long because they quickly react with any other matter they meet. But because space is so empty, ions and radicals can live for tens of thousands of years before bumping into anything. Now, we are moving toward identifying the molecules present in the very heart of the regions where new stars and planets are forming, right at this very moment. We are getting past spotting isolated ions and radicals to more saturated molecules. These include organic [carbon-containing] molecules in the simplest forms, like methanol. From that basic methanol building block, you can build up to molecules like glycolaldehyde, which is a sugar, and ethylene glycol. Both of these are “prebiotic” molecules, meaning they are required for the eventual formation of molecules of life. Where the astrochemistry field is moving next is away from taking an inventory of molecules and toward trying to understand how these different molecules are formed. We're also trying to understand why we might find greater amounts of certain molecules in particular cosmic regions versus other kinds of molecules. TKF: What you just said makes me think of an analogy: Astrochemistry is now less about finding new molecules in space—sort of like zoologists seeking out new animals in the jungle. The field is now more about the "ecology" of how those molecular animals interact, and why there are so many of a certain kind over here in space, but so few over there, and so on. EVD: That’s a good analogy! As we are getting into understanding the physics and the chemistry of how stars and planets form, a significant part is figuring out why some molecules are abundant in certain interstellar regions, but are "extinct," just like animals might be, in other regions. If we continue your metaphor, there are indeed many interesting interactions between molecules that can be likened to animal ecology. For instance, temperature is a controlling factor in the behavior and interactions of molecules in space, which likewise affects animals' activity and where they live, and so on. TKF: Returning to the building blocks idea, how does the building-up process in astrochemistry work, exactly? EVD: An important concept in building molecules in space is one we know from everyday life here on Earth, called phase transitions. That's when a solid melts into a liquid, or a liquid evaporates into gas, and so on. Now in space, every molecule has its own “snow line,” which is the division between a gas phase and a solid phase. So, for example, water has a snow line, where it goes from water gas to water ice. I should point out that liquid forms of elements and molecules cannot exist in space because there is too little pressure; water can be liquid on Earth because of the pressure from the planet's atmosphere. Back to the snow lines, we are now discovering that they play a very important role in planet formation, controlling a lot of the chemistry. One of the most important Lego building blocks, so to speak, that we've found is carbon monoxide. We're familiar with carbon monoxide on Earth because it is produced in combustion, for instance. 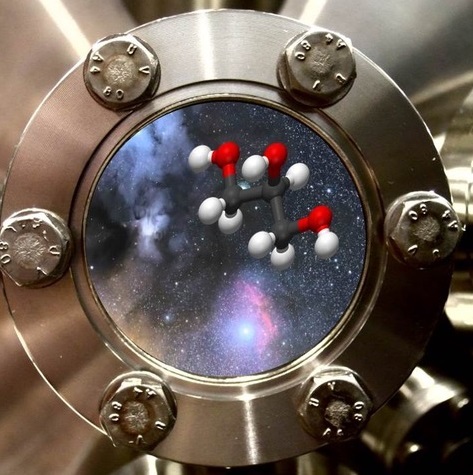 My colleagues and I have demonstrated in the laboratory at Leiden that carbon monoxide is the starting point for making many more complex organics out in space. Carbon monoxide freezing out from a gas to a solid phase is a crucial first step to then adding Lego building blocks of hydrogen. Doing so lets you keep building bigger and bigger molecules like formaldehyde [CH2O], then methanol, on to glycolaldehyde as we discussed, or you can even go to more complex molecules like glycerol [C3H8O3]. That's just one example, but it gives you a sense of how a building-up process plays out in astrochemistry. TKF: You just mentioned your lab at the Leiden Observatory, the Sackler Laboratory for Astrophysics, which I understand has a distinction as the first-ever astrophysics lab. How did it come to be and what have you achieved there? EVD: That's right. Mayo Greenberg, a pioneering astrochemist, started the lab in the 1970s and it was really the first of its kind for astrophysics in the world. He retired and then I kept the lab going. I eventually became director of this laboratory in the early 1990s and stayed so until around 2004, when a colleague assumed leadership. I still collaborate and run experiments there. What we have succeeded in achieving in the lab are the extreme conditions of space: Its coldness and its radiation. We can reproduce the temperatures in space down to 10 kelvin [–442 degrees Fahrenheit; –260 degrees Celsius], which is just a tiny bit above absolute zero. We also can recreate the intense ultraviolet radiation in starlight that molecules are subject to in regions of new star formation. Where we fail, however, is in reproducing the emptiness of space, the vacuum. We consider an ultra-high vacuum in the lab to have on the order of 108to 1010[a hundred million to 10 billion] particles per cubic centimeter. What astronomers call a dense cloud, where star and planet formation happen, has only about 104, or about 10,000 particles per cubic centimeter. That means a dense cloud in space is still a million times emptier than the best we can do in the lab! But this ultimately works to our advantage. In the extreme vacuum of space, the chemistry we're interested in understanding moves very, very slowly. That simply won’t do in the lab, where we cannot wait for 10,000 or 100,000 years for the molecules to bump into each other and interact. Instead, we need to be able to do the reaction in a day to learn anything on the time scales of a human science career. So we speed everything up and can translate what we see in the lab to the far longer time scales in space. TKF: In addition to the lab work, over your career, you have used an array of telescopes to study molecules in space. Which instruments were essential to your research and why? EVD: New instruments have been crucial during my whole career. Astronomy is really driven by observations. Having ever-more powerful telescopes in new wavelengths of light is like looking at the universe with different eyes. To give you an example, in the late 1980s, I came back to the Netherlands when the country was heavily involved in the Infrared Space Observatory, or ISO, a mission led by the European Space Agency. I felt very fortunate that somebody else had done the hard work for 20 years to make that telescope into a reality and I could happily use it! ISO was very important because it opened up the infrared spectrum where we could see all these spectral signatures, like chemical fingerprints, of ices including water, which play major roles in star and planet formation and in water's case, is of course critical for life. That was a great time. The next very significant mission was the Herschel Space Observatory, which I personally got involved with as a graduate student back in 1982. From the chemistry side, it was clear that Herschel was a prime mission for interstellar molecules, and in particular to "follow the water trail." But first, we needed to make the science case to ESA. I went to the U.S. for a number of years and got in similar discussions there, where I helped make the science case for Herschel to U.S. funding agencies. It was all a big push until the mission was finally approved in the late 1990s. Then it still took 10 years to build and launch, but we finally got our first data in late 2009. So from 1982 to 2009—that was a long run! TKF: When and where did your loves for space and chemistry take root? EVD: My main love was always for molecules. That started in high school with a very good chemistry teacher. A lot depends on really good teachers and I don’t think people always realize how important that is. I only realized when I got to college that physics was just as much fun as chemistry. TKF: What academic path did you take to ultimately become an astrochemist? I started looking into the possibility of doing a thesis on molecules in space. I went from one professor to the other. A colleague in Amsterdam told me that to really get into the field of astrochemistry, I had to go to Harvard to work with Professor Alexander Dalgarno. As it happened, in the summer of 1979, Tim and I were traveling in Canada to attend a General Assembly of the International Astronomical Union in Montreal. We found out that satellite meetings were being held before the General Assembly, and one of them was actually happening in this specific park where Tim and I were camping. The idea we had was, "Well, maybe we should take this opportunity and go see this Professor Dalgarno already!" Of course, we had all this camping gear and clothing, but I had one clean skirt with me that I put on. Tim drove me to the satellite meeting, we found my colleague from Amsterdam, and he said, "Oh, good, I will introduce you to Professor Dalgarno." The professor took me outside, we talked for five minutes, he asked me what I had done, what my astrochemistry skillset was, and then he said, "Sounds interesting, why don’t you come and work for me?" That was obviously a pivotal moment. That’s how it all got started. I've never regretted one moment since. TKF: Were there other pivotal moments, perhaps early in your childhood that set you on the path to being a scientist? EVD: Actually, yes. I was about 13 years old and my father had just had arranged a sabbatical in San Diego, California. I took leave of my high school in the Netherlands, where we had mostly received lessons in Latin and Greek and of course some mathematics. But we had nothing yet in terms of chemistry or physics, and biology didn’t start until at least one or two years later. At the junior high school in San Diego, I decided to study topics that were very different. I took Spanish, for example. There was also the possibility to do science. I had a very good teacher, who was an African American female, which at the time, in 1968, was quite unusual. She was just very inspirational. She had experiments, she had questions, and she really managed to draw me into science. TKF: Now looking ahead to the promise of the Atacama Large Millimeter/submillimeter Array (ALMA), which opened several years ago and is among the most ambitious and expensive ground-based astronomy projects ever implemented. Astrophysicist Reinhard Genzel credits you with helping forge the international consensus behind this observatory. How did you make the case for ALMA? EVD: ALMA has been an amazing success as the premiere observatory in this special range of millimeter and submillimeter light that is an important window for observing molecules in space. Today, ALMA consists of 66 radio telescopes with 7- and 12-meter configurations that stretch across a high-altitude plain in Chile. It was a very long road to get to where we are now! ALMA is the result of the dreams of many thousands of people. I was one of two members from the European side on the U.S. Science Advisory Committee for ALMA. I knew the North American science community well from my six years working in the U.S. The two sides, as well as Japan, had very different concepts for ALMA. The Europeans were thinking about a telescope that could be used for deep, very-early-universe chemistry, while the North Americans were thinking much more about large-scale, high-resolution imaging; one group was talking about building eight-meter telescopes, the other about 15-meter telescopes. So I was one of the people that helped bring those two arguments together. I said, "If you build a much bigger array, actually we all win." The plan became to bring a larger number of telescopes together in one array, rather than separate arrays, which are not as powerful. And that’s what happened. We set the tone of working together on this fantastic project rather than being competitors. TKF: What new frontiers is ALMA opening in astrochemistry? EVD: The big jump that we’re making with ALMA is in spatial resolution. Imagine looking at a city from above. The first Google Earth images were very poor—you could hardly see anything, a city was a big blob. Since then, the images have been getting sharper and sharper as spatial resolution has improved with the cameras onboard satellites. Nowadays you can see the canals [in Dutch cities], the streets, even individual houses. You can really see how the whole city is put together. The same thing is happening now with the birthplaces of planets, which are these tiny disks around young stars. Those disks are a hundred to a thousand times smaller than the clouds we've looked at previously where stars are born. With ALMA, we’re zooming into the regions where new stars and planets are forming. Those are really the relevant scales to understand how those processes work. And ALMA, uniquely, has the spectroscopic capabilities to detect and study a very wide range of molecules involved in those processes. ALMA is a fantastic step forward from anything we’ve had before. TKF: The new telescopes you have gotten to use over the span of your career have proven extraordinary. At the same time, we’re still limited as to what we can see in the cosmos. When you think ahead to future generations of telescopes, what is it you most hope to see? EVD: The next step in our research is the James Webb Space Telescope [JWST], set to launch in 2021. With JWST, I’m really looking forward to seeing organic molecules and water on even smaller scales, and in different parts of the planet-forming zones, than is possible with ALMA. But ALMA will be essential for our research for a long time to come—another 30 to 50 years. There’s still so much we need to discover with ALMA. However, ALMA can’t help us study the very inner part of a planet-forming disk, on the scale of where our Earth formed, just a short distance from the Sun. The gas in the disk is much warmer there, and the infrared light it emits can be captured by an instrument that my colleagues and I have helped implement for JWST. JWST is the final mission that I’ve worked on. Again, it was by chance that I got involved, but I was in a good position with my American partners and colleagues to help. A number of us from the European and U.S. sides came together and said, "Hey, we want to make this instrument happen and we can do it in a 50/50 partnership." TKF: Given your work on the building blocks that make up stars and planets, does the cosmos seem amenable or even conducive to life? EVD: I always say that I provide the building blocks, and then it’s up to biology and chemistry to tell the rest of the story! [Laughter] Ultimately, it matters what kind of life we are talking about. Are we talking about just the most primitive, unicellular life that we know arose quickly on Earth? Given all the ingredients that we have available, there’s no reason why that could not arise on any of the billions of exoplanets that we now know are orbiting billions of other stars. Going to the next steps of multicellular and ultimately intelligent life, we understand very little yet how that emerges from simpler life. But I think it's safe to say given the level of complexity, it is less likely that that will arise as often as, say, microbes. TKF: How will the field of astrochemistry help us answer the question of whether there is alien life in the universe? EVD: Studying the chemistry of exoplanet atmospheres is what will help us answer this question. We will be finding many potentially Earth-like exoplanets. The next step will be to look for spectral fingerprints, which I mentioned earlier, in the planets' atmospheres. In those fingerprints, we will specifically be looking for "biomolecules," or combinations of molecules that could indicate the presence of some form of life. That means not just water, but oxygen, ozone, methane, and more. Our current telescopes can just barely detect those fingerprints in exoplanets' atmospheres. That’s why we’re building the next generation of giant ground-based telescopes, like the Extremely Large Telescope, which will have a mirror that is about three times as big as anything around today. I’m involved in making the science case for that and other new instruments, and biosignatures are really one of the top goals. That's the exciting direction where astrochemistry will go.